Who’s Snooty? Certainly not Davidson! Nick James, bless his heart, took on the arduous task of determining the most snobby places in the great state of North Carolina and deemed our little village of Davidson as the #1 most snobby Tarheel town (roadsnacks.net). While Davidsonians thrive on list-topping, here we beg to differ. It’s not that we’re putting on airs, the air is just better here. Okay, it’s true, we take education seriously. Seventy percent of us who live in Davidson have at least one college degree. We are home to Davidson College, which is, yes, a private institution where tuition plus room and board total about $60K per year. Davidson’s admission team is not so much snooty as selective, admitting only very, very smart students—not only very, very smart wealthy ones, either. Thanks to the college’s extremely well-endowed trust, very, very poor but really, really smart kids can attend, too, and graduate debt-free. (Very, very smart middle class kids have to go to Chapel Hill, located in the state’s second most snobby city.) FYI, Davidson College consistently ranks as one of the top ten liberal arts colleges in the country and is where Stephen Curry played college ball, not that we’re bragging or anything. Children who aspire to one day attend Davidson College can begin their education at Davidson Day where tuition begins at $14,900 for Jr. Kindergarten and graduates from there. For tuition-averse families, there is also Community School of Davidson, where admission is by lottery and the odds make Vegas look like a better bet. And just because we’ve stuffed nearly a baker’s dozen worth of restaurants within a two-block slice of Main Street, does not mean we’re uppity—maybe we’re just hungry. The Soda Shop, the oldest, dating back (with a few interruptions) to the 1950s, is about as unpretentious as it gets: burgers, fries, milkshakes (though they are made with DeLuxe Ice Cream). There are also: Summit Coffee, Ben & Jerry’s, Toast, Flatiron and Il Bosco, surrounded by a sudden surge of new places: Pickled Peach, Millstone Bakery, Mestizo, Kindred, and Upper Crust Social Club and Bar. Bon Appetit named Kindred one of 2015’s hot ten new restaurants, thanks in part to dishes that feature fennel pollen and sea-urchin butter. 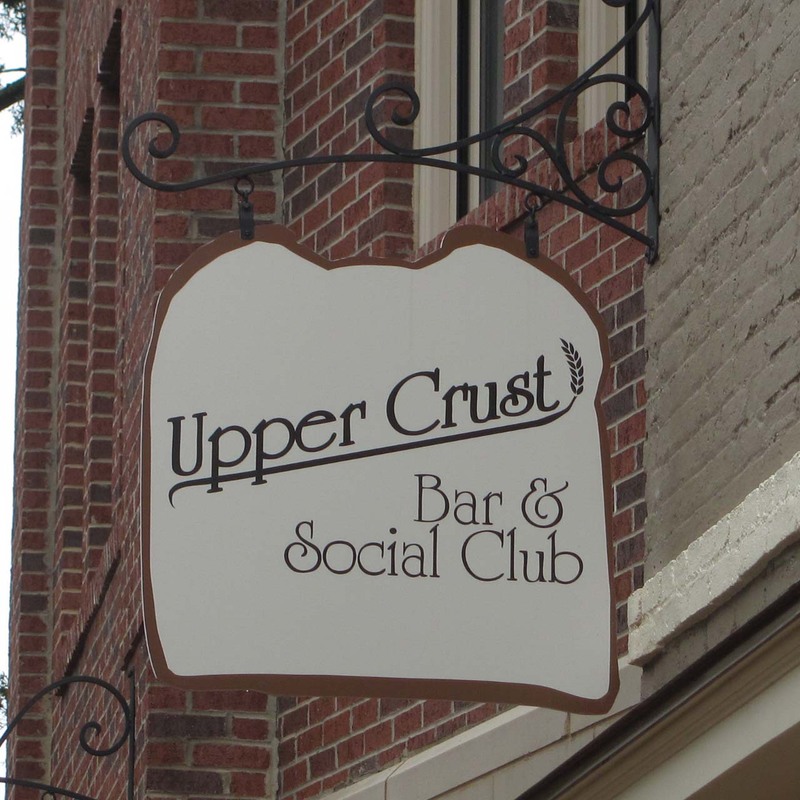 But Upper Crust Social Club and Bar, the 49-seat, fireplaced, second-story aerie where “Seafood Towers” top out at $87 each, surely takes the cake. And speaking of cake, no matter where you dine, have dessert at Mestizo: $8 for a piece of Impossible Cake, a rich, chocolate spongy base topped (impossibly) with flan and streaked with warm caramel. One who appreciates art is not necessarily arrogant, especially when visiting Sanctuary at Davidson, a gift shop/gallery, where locally crafted items are heartfelt, or at least silk felt—like the nuno scarves (a Japanese take on felted silk) for $54 or the paintings, including a bleeding turquoise triptych that looks way cooler than I’m describing it, $400 per panel or all three for $900. A bargain! And smack in the middle of the block is Main Street’s mainstay: The Village Store. For any mom en route to a kid’s birthday party sans gift, card, and wrapping paper, this is the place to go. Handily situated near the register are up-to-the-moment trendy things for youngsters, like “Whiffer Sniffers,” AlphaBed pillows, and How To books on testing your IQ. Plus, they wrap for free. It’s probably our bookstore, however, that pushes our snob quotient into the stratosphere. Main Street Books, ironically located directly across the street from the library (where you can read a book for FREE), is greatly revered. People love to hang out there, even people who have no intention of ever buying a printed book again and who stand right inside the entrance with their double-wide baby jogger strollers saying how nice it is to have 30-40 books in their phones. Actually, perhaps a thank you is in order. Nick James, we are honored. No town deserves the title more.